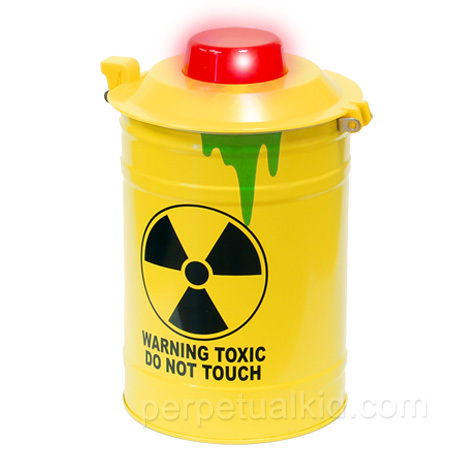 Toxic Waste Cookie Jar Keeps ‘Em Safe « Gluttoner: You gonna eat that? Whether you’re making delicious homemade cookies or buying them from the bakery and then throwing out the package to pretend you made your own delicious cookies, you need to safeguard them from prying hands. Everybody loves cookies- especially other people’s cookies (you down with OPC, yeah you know me, who’s down with OPC? all the fat ladies…or something like that). That’s where the Toxic Waste Cookie Tin comes in to the rescue. If the big warning sign on the side isn’t enough to keep those cookie thieves at bay, then the flashing warning light and siren that sounds when you open the lid should do it. That’s right, this cookie tin is fully alarmed. Your cookies are safe.